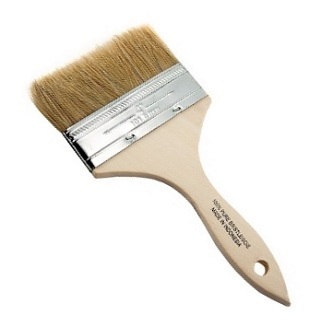 PRODUCT: 4 inch Wide Natural Bristle Paint Brush / Chip Brush, set in Wood Handle. Price/Brush. (1). Bristles are tapered and neatly cut for accurate paint application. Inexpensive paintbrush useful in all fields. Recommeded for applications using petroleum or solvent based materials and roofing tars.